In Dorset we are on forbidden ground and hasten to leave it, our journey commencing at the Nine Stones, a semi-circle of large slabs by the side of our road, possibly part of a now ruined cromlech. Our point of departure is where three ways meet, one from the great hill-fortress of Eggardon, another from Durnovaria, the third from the immense, recently explored Maiden Castle. We travel westward along a high, bleak downland and our road is numbered XV in the Roman Road-book, known as the Antonine Itinerary. Of high antiquity, is all that we can say of the origin of the Way we set out to trace, and now approach the border of this county by the Colway, crossing the steep-sided hollow north of Lyme Regis, along Clappentail Lane (A.S. clappan, to pulsate) continuing on high ground, then descending to cross the Axe and Coly, through the hamlet of Colyford, where was a way-chapel dedicated to St. Edmund, Abp. The road is now Harepath, Anglo-Saxon, army-way. An earthwork, with double vallum, commands the road. Three parishes meet on it at Hangman’s Stone, and it may be that ‘stone’ is a reduplication of ‘maen‘. For four miles we are on high ground. An earthwork (where many sling stones and a bronze celt have been found) related to Blackbury Castle to northward, lies athwart the road, commanding it both east and west. Diabolical origins are often attributed to such ridges and banks of earth, but here a milder tone prevails, an elf or sprite, and it is the Elverway. In earliest times the Way passed along Paccombe – the path-combe (cf. Pafford, by assimilation from Path-ford) thence by Knowle to Sidford, thence as High Street to Stowford, thence as Greenway Lane, a boundary. For more than half a mile this lane is utterly derelict, and to traverse it is something of an adventure. It is to be noted that this ancient Way leading to the Otter lies in the one and only pass through the long ridge of high land which extends from the sea at High Peak, along East Hill and the Blackdowns, right round to Culmstock Beacon and Maidendown, a distance of nearly twenty-nine miles. This pass would be found and be in use in the time of the earliest inhabitants. The fording-place of the Otter was some few yards downstream from the present bridge and our Way is but a footpath at the back of the cottages in the village street of Newtown Pebble-ford. A way-chapel, a chantry, was built in 1331, and as was usual, the south door was towards the Way. Now the village street is to the north, and the church door on that side. At the top of the village the Way is a turnpike road again. Tumuli lie near it; a wayside cross has been removed and exists only in remembrance, giving name to an hostelry – the White Cross. At Bishop’s Clyst the river is passed at the narrowest point of the marshland. The bridge has been widened and the excellent square ribs of the older portion remind one of the vaulting of the Norman undercroft of St. Nicholas’ Priory, Exeter. The boundary line carries us into Quarry Lane, direct, though now narrow. At its western end the ground has been considerably altered by quarrying. A slight change in direction points towards Heavitree. A small stream is passed by a footbridge. The pitiful ruin of St. Loye’s, a way-chapel, stands hard by. The wayside Cross is preserved in the grounds of St. Loye’s House. The Way is lost to the public after crossing Salter’s Road, but a footbridge precisely on the line and five gateways, one very wide, all in line, give its exact course leading to Heavitree Park. After the hilltop it becomes Wonford Road, in its generous width, and next it is Magdalen or Maudelyn Street. Our way is now blocked by houses fronting us, standing on the actual course, and leaving but a narrow and unprepossessing passage about five feet in width. The properties now filling ‘Quay Lane’ are shallow and without historic interest. On Roque’s Map of 1744 cultivated ground is shown where now are houses. Let them in imagination be swept away and then observation reveals that our Way occupied the space between the Friary Wall and the City Wall. Old maps indicate this. The Way existed before the Wall, which latter was brought out to it, and the space immediately inside filled in with loose material, which in recent years has, at one point, brought down the masonry, and remains an unedifying spectacle of disorder. The Way leads over the lower ground to the ford of Exe, the Horsewater. Roque’s map shows a small bridge over a leat on the way thither, and clearly marks the little gravel strand on the Shilhay and also on St. Thomas’ side. There to-day the space by the Bank premises indicates precisely the fording place, correctly in line with St. Thomas’ Street, which street is shown in Speed’s map, 1620, as a wide country road, and is continued now as Cowick Street. At the Double-headed Cross in that street a road branched southward to Kenn and Haldon, thence to the important ford on the river Teign below Kingsteignton. (Trans. Dev. Assoc., 271). The western end of Cowick Street led to Rolls Bridge and so to Long Down, where the Hackway branches to the right and curves around the hollow of Holcombe Burnell (A.S. hack, a hook). 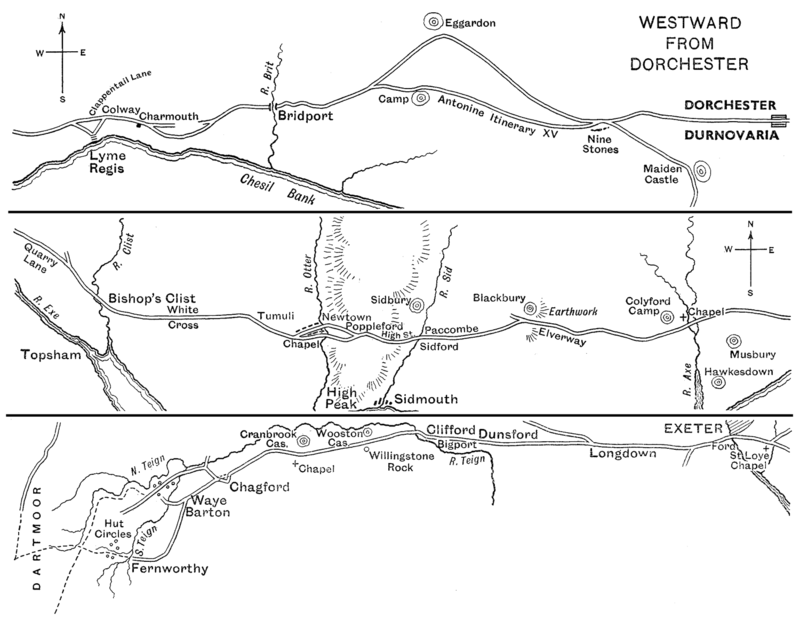 We continue the direct western line, which at Two Crosses is crossed by an ancient N. and S. ridge road, and we keep our line through Dunsford to a sharp bend close to the Teign. A small river-plain provides here a stretch of flat ground. The Way divides, one branch keeping to the eastern side of the river, passing through Drewsteignton, with its wide village street, onward to Whiddon Down, a natural road-centre for the north-west and western regions. The other branch passes the river, now bridged, at a ford named from its position at the southern end of the cleave or gorge through which the Teign flows, Cleave-ford, Clifford. The ancient house which lies at a short distance is Clifford Barton. Road crossings and road forks often became in time points for buying and selling, a staple, as Portgate on the Launceston road. The farm near the sharp bend in the road bears the name Bigport (A.S. bige, a sudden bend or bight), the market at the bend. Wayfarers and horsemen would rest awhile at the small plain, deep in this difficult country. After crossing the river an ascent is made to the thousand feet line, passing Willingstone Rock, A.S. Wealan Stan, the Stone of the Strangers, i.e., the West Wealas, a name certainly reminiscent of the time and place when the defending Britons withstood the advancing Saxons. The camp, Wooston Castle, is named from it, though perhaps not readily recognized in its crumpled form. And now alongside the ancient Way lies the great earth-fortress, Cranbrook Castle. A moorstone post, maybe a cross shaft, at a junction, bears the capitals C and E, for Chagford–Exeter. The descent to Easton Cross is down a hillside which has a slope of four hundred feet in half a mile; a very early track, a line, not of convenience, but necessity. A way-chapel stood not far from the road, and the site was long used by a neighbouring hamlet as a burying-place. From Easton Cross our way is directly moorwards, leaving Chagford a little to the south, on to Waye Barton. Several winding and irregular lanes give approach to the open moor, one of which is distinguished by the name Holy Street. If we regard Waye as on the chief road, then we pass to Fernworthy, thence a rough cart road leads upwards, becoming a footway on the open ground, passing through a hut circle village to a clapper bridge over the head waters of the Teign. Some of the moor tracks are undoubtedly those of tinners, but this leads in about a mile without a check into the road crossing the moor, shown on the Dartmoor Map in Exeter Museum, a road which passes through two regions of stone groups and remains, namely those about the N. and S. Teign and Wallabrook, and that extensive region around the upper waters of the Walkham, at length leaving the moor at Whitchurch Down towards Tavistock. Notwithstanding the numerous memorials, circles, rows, menhirs, huts and ceremonial stoneways, we possess but meagre vestiges which remain to us after centuries of spoliation and removal, and many miles of wall on the moor and the more habitable parts of the foothills and bordering districts, are the result of that destruction. Those were not weaklings, the primitive folk, who heaved into position the granite fragments for their dwellings and for the purpose of their tribal rites. Research at Maiden Castle has revealed an Iron Age ‘B’ culture from the south-west of Britain, and at the same period a strengthening of defences and adoption of stone-walling by new-comers used to building in stone. Experienced researchers maintain that such stone-masons could only have come from the west. From the prehistoric of the neighbouring county to the prehistoric of our own, we thus have an unbroken line of way, on which many points of history are added appertaining to the centuries that have rolled between.